When trees arrive from the nursery with their roots wrapped in burlap, you have to remove most of the burlap, any ropes or twine, and nails or wire used to secure the burlap before planting. If it's natural untreated burlap, you can leave some of the material in place, but anything synthetic must come off. The trick is to accomplish this task inside the planting hole without disrupting the roots and damaging the tree. Start with a planting hole that measures the same depth as the root ball from the base of the roots to the point where they meet the trunk. Make the hole three times wider than the diameter of the root ball. Before unwrapping the roots, set the tree in the center of the hole. To move the tree, lift it carefully by the roots and never by the trunk. The soil around the roots makes the root ball heavy. Lifting the tree by the trunk could damage the roots, compromising the tree's ability to survive in the new environment. Ask someone to assist if the tree is too heavy for you. Using a pair of clean, disinfected shears or garden scissors cut away rope and twine from around the outside of the root ball. The rope keeps the burlap in place during storage and transport, but if left on in the planting hole it can hinder root growth. Also look for and remove any nails or other fastening materials holding the burlap in place. Unwrap the burlap, and cut it away from the base of the root ball. If the burlap is made out of natural material, you can leave some at the bottom of the root ball and allow it to decay naturally. Synthetic material, however, should be completely removed. To remove the burlap, lift the root ball up and pull the burlap out. For large or heavy trees, you can rotate the tree in the hole, cutting away a section of exposed material each time you tilt the tree. Sometimes balled and burlapped trees have a wire cage around the outside of the root ball. Cut away the bottom of the wire cage before you place the tree in the planting hole. Wire cutters work best. Only remove the very bottom of the wire cage. When you go to shift the tree into the hole, you want enough wire around the roots to hold the root ball in place. Once the tree is set inside the hole, cut away the rest of wire cage from around the outside of the roots. Once you have all the burlap and other materials removed, fill in the hole, patting the soil down as you go. Water the soil as soon as you're finished. Follow up after planting with a thorough watering every seven days for the first growing season. You can store the tree with the burlap on for two to three weeks if it's not possible to plant it right away. 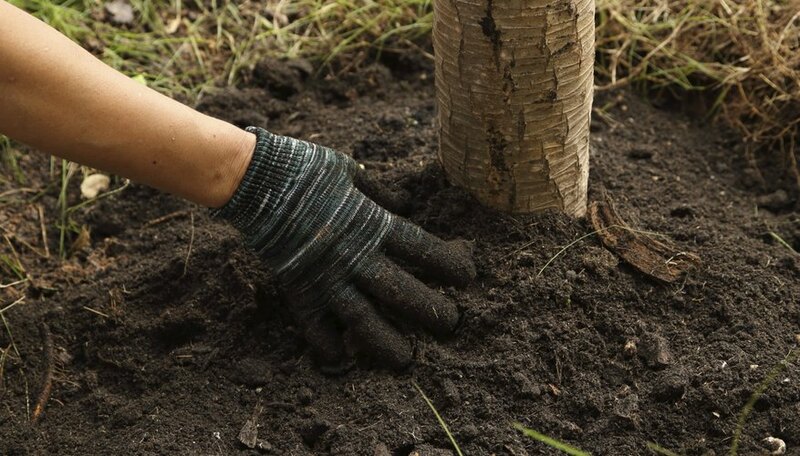 Keep the tree in a shady place, and water the root ball whenever it starts to dry out. If it's hot, you may have to water every day.